The family of Samariya Nadeem staged a protest this morning in front of the city's press club. For the past three weeks, their 16-year-old daughter has been in the hands of a wealthy landowner. As police and the authorities fail to free her, the Catholic Church calls for justice on the family's behalf. But for Muslim cleric, it is "not illegal to abduct and convert non-Muslims". 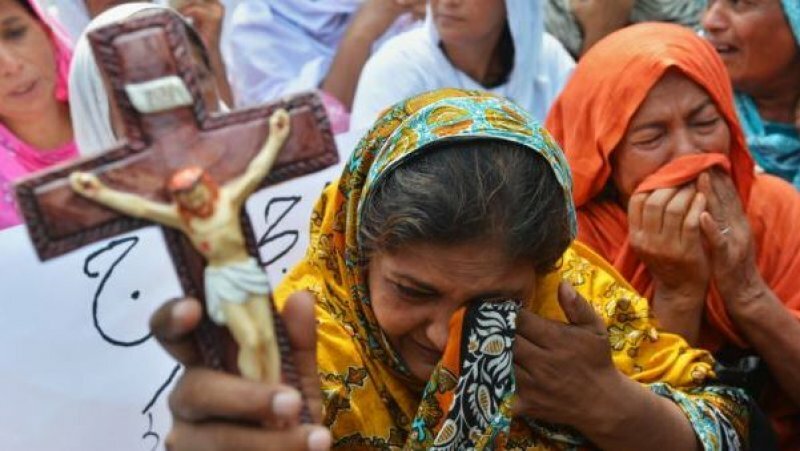 Lahore (AsiaNews) - After a Pakistani Christian girl from Punjab was abducted by a Muslim landowner, she was forced to marry him after conversion to Islam. Her family reacted in a public protest, demanding justice from civil authorities. Police and the courts have failed so far to act and return the girl to her parents. The local Catholic Church has instead backed the family, condemning the "widespread practice" of kidnapping young Christian and Hindu women to marry them forcibly to Muslims and reduce them to a "state of slavery". The latest episode involves a 16-year-old girl, Samariya Nadeem (Masih), who was abducted and forcibly married to a rich landowner. The abduction took place 22 days ago in 270-TDA Layyah District when the young woman was on her way to school. The family filed a complaint (First Information Report 14/14, under Section 365 B of the Penal Code) with the police for the abduction reporting that Samariya was taken against her will and forced to marry the man. So far, police have failed to pursue any legal action against the local wealthy Muslim landowner who abducted the girl because of the influence he wields. Police investigators were also unable to talk to the bruised and terrified victim. Anonymous police sources confirmed that the girl was "abducted" and forced to marry. However, an Islamic cleric involved in the affair said that it was "not illegal to abduct and convert non-Muslims". This morning, the family organised a protest rally in front of the Lahore Press Club. Under Pakistani law, no one underage can be married without parental consent. Civil society groups and human rights activists have appealed to Punjab's chief minister to take action and return Samariya to her parents and bring her abductor to justice. Kidnapping and forced marriage have become a major issue in Pakistan, especially in southern Punjab and in the interior of Sindh province. This is "very common in the region," said Fr Haroon James, a priest and activist in Lahore. Young women and girls "are forcefully converted and married to influential landlords who keep them as slaves." Unfortunately, people seem to be increasingly "hopeless". For this reason, the Church has spoken out in the case, "demanding justice for her and the family." Yet, "Despite the fact that a FIR has been registered, the authorities have failed to act and protect the vulnerable," the priest added. Violence against ethnic and religious minorities is commonplace across the country, with Shia Muslims and Christians as the main target, with things getting worse. Dozens incidents of violence have occurred in recent years, against individuals or entire communities, like in Gojra in 2009 or Joseph Colony in Lahore in March 2013, often perpetrated under the pretext of the country's blasphemy laws.